Shortly after getting off the bus in Nagorno-Karabakh’s capital, Stepanakert, while walking slightly lost down the high street, we're approached by local guy who asks us what we're looking for. I eye him up, assessing whether he’s trying to get something out of us or genuinely just wants to help: he’s in his 20s, wearing skinny jeans and a brightly-coloured cardigan and has a smartphone in his hand, so I guess at the latter and tell him I need an ATM. "Come with me," he says, and leads us to a cash point just down the road. He asks if we’ve already found somewhere to stay: I tell him we have, in the neighbouring town of Shushi, and that we're just going to walk around Stepanakert for a couple of hours to see the sights before getting the bus onwards. After trying in vain to convince us that this town is a better choice to stay in, he asks what we want to see here before leaving. I admit that we don’t know what there is to see, and ask his recommendations. After discussing the possibilities I decide to go and see the iconic monument on the outskirts of the town. At this point, however, instead of bidding us farewell, this guy starts leading us in the direction of the monument, without a word of explanation, as if it were the most natural thing in the world for him to accompany us. Doesn’t this guy have things to be doing? I wonder to myself. I begin to think of the old trick used in the souks of Marrakech, whereby locals give unsolicited “tours” to foreigners and then violently demand payment. I make sure my wallet’s safely in my pocket, but remain outwardly friendly. The guy tells us about himself: he has studied English at university and now works for a mobile phone company. He then begins to show us photos on his phone of various people that he refers to as “my tourists”, explaining that he sometimes has travellers stay at his house. We find the whole thing more than a little weird, so after walking to the monument, snapping a few photos and then returning to the town centre (the whole trip taking about half an hour), we tell him we're just going to grab some lunch at a nearby café and then leave town. He smiles, says that he might come join us shortly, then waves goodbye and walks off. To this day I don’t know what to think of the incident. In the Caucasus it’s not at all uncommon for locals to be incredibly accommodating and helpful to foreigners, but there was something in the whole episode that made me feel uncomfortable. Did he really hang around town all day waiting for tourists to show around, just for fun and to practise his English? Maybe he just did it in the hope of getting a tip, but was too proud to actually ask for one. He didn’t exactly offer me to stay at his, but he kind of implied that it was an option… perhaps he just wanted us to stay at his in exchange for a fee. Was he an outright conman who couldn’t exact his plan because I already knew what I was doing? Was he just a slightly underhand beggar? Was he a Good Samaritan? I just don’t know. This was a fitting introduction to Nagorno-Karabakh for us, as the place is pretty much defined by uncertainty and ambiguity. What even is Nagorno-Karabakh? The local authorities insist that it’s an independent state. According to the Azerbaijani government – and the UN – it’s part of Azerbaijan. But in many ways it seems to a traveller to be part of Armenia. It seems that even the name of the place can’t be agreed upon: it is variously referred to as Nagorno-Karabakh, Mountainous Karabakh, Upper Karabakh, Artsakh or just Karabakh. 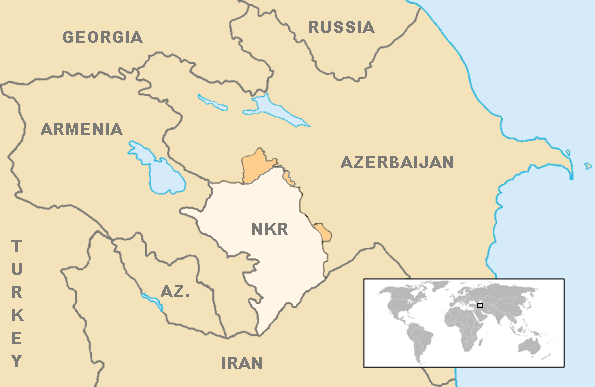 During Soviet times Nagorno-Karabakh was part of Azerbaijan, but it enjoyed some limited autonomy due to the majority of its population being ethnically Armenian. Although it made relatively little sense for this Armenian-dominated region to be part of Azerbaijan rather than neighbouring Armenia, it wasn’t seen as too much of a problem while both countries were part of the USSR anyway. This all changed in 1991 with the Soviet Union’s collapse, which saw the geneses of the Republic of Armenia and the Republic of Azerbaijan as independent nation states. In Nagorno-Karabakh a referendum was held, with the majority in favour of independence, but Azerbaijan’s new government denied the vote’s validity. A war ensued in which the Armenians of Nagorno-Karabakh, supported by the Republic of Armenia’s army, fought against the Azerbaijani army. Three years and some 35,000 deaths later, a ceasefire was called on terms favourable to the Armenians. Since then Armenia has effectively occupied Nagorno-Karabakh, establishing a kind of quasi-independent puppet state that has been left in limbo due to lack of international recognition. Armenia and Azerbaijan still have no diplomatic relations whatsoever and are legally in a state of war, with occasional skirmishes still occurring along the border. The only way to visit Nagorno-Karabakh is from Armenia: that much is certain. However, when planning my trip I was perplexed by a mess of contradictory information online and in travel guides about how exactly to gain access as a tourist. Some sources were sure that one needed to get a visa from the “Permanent Representation of the Nagorno-Karabakh Republic” (the de facto embassy) in Yerevan, while others claimed with equal certainty that one could only obtain a visa once in Nagorno-Karabakh’s capital, Stepanakert. The latter would’ve been much more convenient for me, so shortly after arriving in Armenia I phoned the “Permanent Representation” to confirm whether it would be possible. After explaining my query at length in my finest Russian, the man on the phone responded “Мне нельзя сказать можно или нельзя.” “I can’t say what is or isn’t possible.” Apparently I was naïve to think that phoning the authorities directly would clear up the uncertainty. Not liking the idea of getting turned away at the border, we got our visa in Yerevan in the end, but to be honest even the border guards didn’t seem sure whether tourists needed visas. Nagorno-Karabakh "with the exception of the front line"
Republic of Azerbaijan - I'd never been banned from a country before! After our free guided tour of Stepanakert we got the bus to Shushi, a smaller town just 10km away. The imprudence of arriving after dark became evident when it became apparent that the town was entirely void of streetlights. 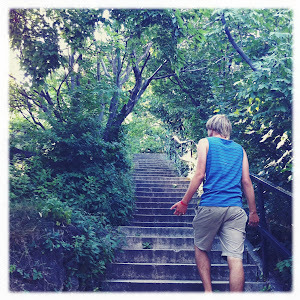 We had no idea where our guesthouse was located so employed the old-fashioned method of asking a bystander if he knew. Upon hearing the name of the guesthouse – “Saro’s” ­– the man’s face lit up and he got out his mobile phone. Not only did the first person we asked know where our guesthouse was, he also had the owner’s phone number. After a brief exchange over the phone, he pointed us down an uninvitingly dark track and told us that Saro would meet us halfway. After ten minutes or so of tentatively wandering through the ancient alleys of Shushi’s ruined old town, we saw a figure approaching through the darkness. As he got closer I saw that it was a man in military combat gear and I braced myself for an interrogation, remembering that this was after all an occupied territory and a warzone; there would no doubt be suspicion of the presence of a pair of British backpackers in this remote and volatile corner of the world. Much to my surprise the camouflaged man greeted us with a huge smile and enthusiastic handshakes. He introduced himself, in very good English, as Saro, our host. Was he some kind of guerrilla or local warlord? No, the uniform was a relic of his days in the Soviet army, which he now just wore for gardening. I recalled instantly the fact that my own father, a former member of the British army, often wears his old combat gear for gardening too, and felt foolish for my previous assumptions. At his beautiful home, over a great deal of Russian vodka and homebrewed fruit liquor, Saro told us all about himself, Shushi and Nagorno-Karabakh. Shushi, known in Azeri as Şuşa, had been a stop on the Silk Road in the Middle Ages, and as such had developed a mixed population that included Armenians, Azeris and Persians. At the start of the twentieth century, by which time the rest of Nagorno-Karabakh was overwhelmingly Armenian, the town’s population was about half Armenian, half Azeri, with each group inhabiting a separate quarter. Ethnic tensions erupted due to the fall of the Russian Empire and a surge of nationalist ideals, and in 1920 widespread rioting resulted in the massacre of much of the Armenian population and the flight of the remainder. 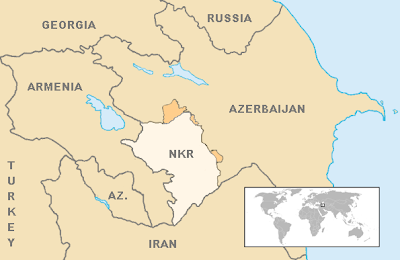 After the Soviet Union took control of the region and restored stability, Shushi remained an island of Azeris in Armenian-majority Nagorno-Karabakh. This situation persisted until 1992, when Armenian forces captured the city, looting and burning shops and homes, and expelling the Azeri population. Since the ceasefire the town had been repopulated with Armenian refugees from Azerbaijan (the Armenian population of Azerbaijan were expelled from their homes, as were the Azeris of Armenia and Nagorno-Karabakh). Saro, my host, was one such refugee: his hometown being Baku, Azerbaijan’s capital. He and the other refugees had rebuilt their new homes themselves. Donations from the Armenian diaspora had funded some regeneration, but much of Shusha remained in ruins. Saro drew us out a map of the town and indicated a route by which we could see everything in a day, and the next morning we set out to do exactly that. Wandering the streets of Shushi was an enchanting experience; the town had an atmosphere unlike that of any place I’d ever been, with parts of the old town feeling as though they had been abandoned in the Middle Ages and left untouched ever since. Especially captivating were the two mosques – left unused and decaying since the expulsion of the Azeris, but protected against vandalism or demolition by local law – and the old university –a crumbling shell of a once magnificent building. Just as amazing as the town itself were the jaw-dropping landscapes surrounding it. After having seen the whole town, we headed out into the countryside on the route Saro had indicated, descending into an enormous canyon. “Nagorno-” is a Russian prefix meaning “mountainous”, and the scenery is fittingly dramatic. Shushi, a town with a fascinating if tragic history, a unique ambiance and an unbelievably beautiful setting, is possibly my favourite place from my whole Caucasian trip, and my brief stay there left no doubt in my mind that the whole ordeal of getting into Nagorno-Karabakh was absolutely worthwhile.